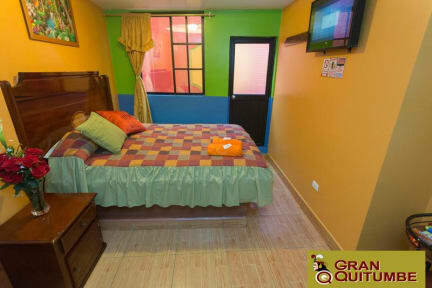 Hotel Gran Quitumbe is a new modern hotel that offers 24-hour reception, cafeteria for breakfast, and rooms with wheelchair access, parking, and additional cost direct shuttle from the airport to the hotel. We also offer free city map, Laundry Facilities and Safe Deposit Box. 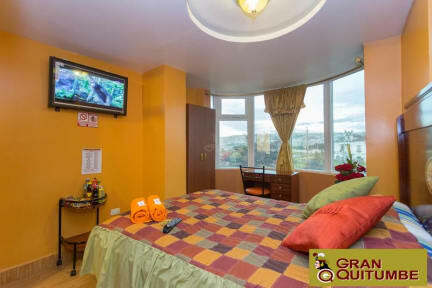 Hotel Gran Quitumbe is located in the south of Quito, at Av. Mariscal Sucre and Condor Nan corner, opposite the bus terminal Quitumbe strategic area for the movement of tourists is in the city as other potential tourist destinations like the Cotopaxi National Park the Ilinisas, the city of Bath, Otavalo, Ecuador's jungle and beach etc. Breakfast not included - 2.50 USD per person per day.